Pineapple is my all time Favorite. In my home everyone loves Pineapple. And Eggless Pineapple Cake tastes yummy and delicious. It is an extremely moist cake and very easy to prepare. I have used fresh pineapple for the puree.This time I made Pineapple Pastry ,It tastes yummy and delicious on its own.. Pastry is a term used in India to refer to any cake made with a fresh cream filling or frosting. The most popular ones are the Black Forest and Pineapple pastries. 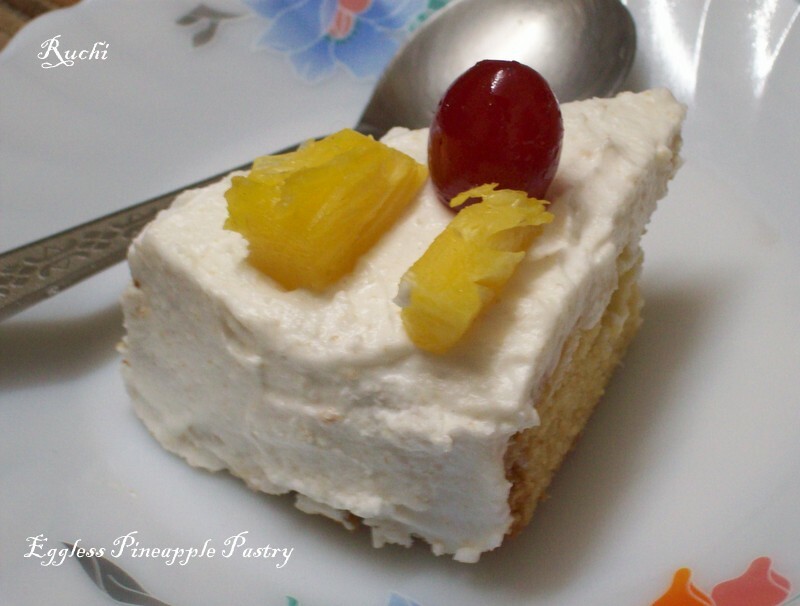 This cream pastry recipe is prepared with pineapple flavor and is almost the same as the typical pineapple cream cake. It only differs in topping, with Fresh cream in used in the topping which sets nicely and quickly so its not necessary to chill the pastry before serving. 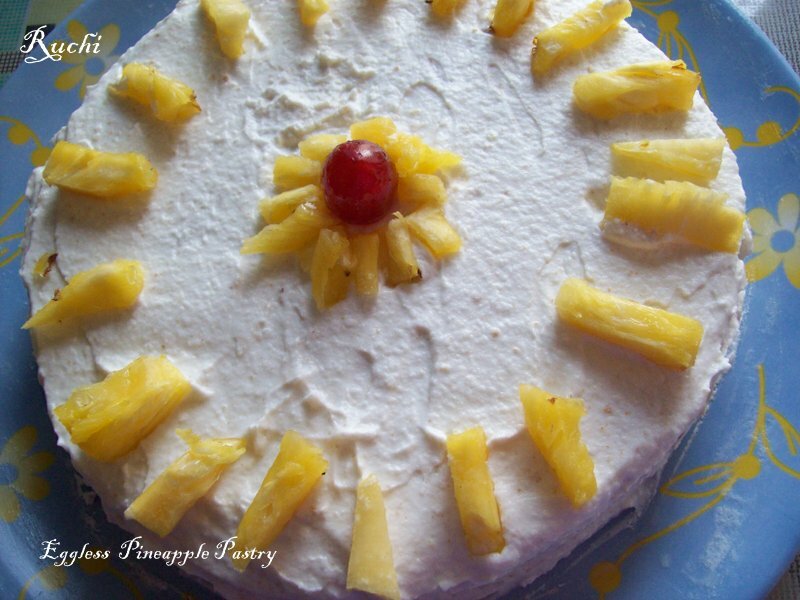 This cake has subtle flavors and if you love pineapple you will adore this cake. Beat well till the cream is thick and forms soft peak. Keep refrigerated till use. 1.In a mixing bowl combine flour, baking soda and baking powder sieve and Keep aside. 2.Add condensed milk, butter, Pineapple essence and Finally add 3/4 of pineapple puree. Mix and stir and fold everything together. 3.Scrape batter into a greased 6" round cake pan. Preheat oven Bake at 180C. 4.Bake for 20 to 25minutes or until a toothpick inserted at the centre comes out clean. 5.Allow the cake to cool properly before frosting. 6.Whip 400ml whipping cream with 4tbs powdered sugar +1 tsp pineapple essence until thick and holds peaks. 7.Now divide the cooled cake horizontally into half using a serrated knife. 8.Carefully slide the top layer using a cake lifter or cake board or a flat plate and keep it aside. 9.Keep one layer of the cake on the serving plate.Sprinkle 5-6 tablespoons of sugar syrup on it. 10.Now spread prepared cream frosting on it. 11.Put other layer back on the first layer making it a full cake.Again spread sugar syrup on it. 12.Cover the cake completely with cream frosting on all sides and the top. 13.Level the top and sides with a broad spatula dipped in chilled water. 14.Decorate the top with pineapple pieces and halved cherries on top. 15.Keep chilled in the fridge till use. Wish to have a slice anytime,my all time favourite..